Stress is vital for survival. Surprised? It’s true. The stress response allowed early humans to not be eaten by larger animals. We always hear about how bad stress is, but it can also be helpful. Stress can motivate you to focus on what you need to do, or it can be completely overwhelming and prevent you from doing what you know needs to be done. Whether stress is helpful or harmful can sometimes depend less on the source of stress and more on the response. When faced with a challenging situation, the body responds with a surge of hormones designed to help you meet the challenge. Generations ago, challenges included running from hungry tigers. Today, those tigers are more likely to take the form of expenses, work, kids, spouses, housework, etc. Though these tigers are less deadly than those our ancestors faced, they are much more relentless. The same physiological response can help us meet these challenges, but must be more carefully managed to avoid causing health problems. Cravings – Stress hormones have been shown to trigger cravings for foods that are high in sugar and fat. These foods are a good source of quick energy, but not always the greatest source of good nutrition. Insomnia – One of the effects of stress is a state of hyperarousal. When you’re faced with a literal hungry tiger or other immediate danger, this can help you survive. It can also make it difficult to shut down for good quality sleep at night. When stress hormones are combined with suboptimal nutrition and poor sleep quality, we end up with a perfect storm that can lead to depression, anxiety, fatigue, and heart disease. Some studies have even shown that people who are under a great deal of stress are at increased risk of developing cancer. Reducing and managing stress can, quite literally, prolong your life. Fortunately, managing stress doesn’t have to be complicated. Avoid caffeine, alcohol and nicotine – while they may seem to reduce your stress or help you cope, they will ultimately increase your stress. Exercise – The physiological stress response is known as the fight or flight response and is designed to help you either fight or run from danger. Physical exercise, even if it doesn’t involve fight or flight, is one of the best ways to metabolize stress hormones. Rest – Yes, stress can cause insomnia, but insomnia can also increase your stress, leading to a vicious cycle. Establishing a bedtime routine that helps you relax and sets your mind at ease can help you get better sleep. 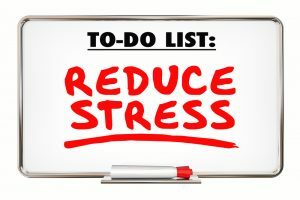 Relaxation – Meditation and relaxation techniques are great ways to help you deal with stressful situations. There are several techniques, so experiment to find the ones that work best for you. Take control – In many cases, stress is aggravated by circumstances that seem beyond our control. In these cases, the best way to manage stress is to face the problems head on and look for constructive solutions. Talk to someone – Talking to someone about what is causing you stress can help you release some of the associated tension and anxiety. Talking to a friend can help, but a qualified profession like the psychologists at Chiropractic and Allied Health can help you find ways to manage your stress and improve your health. To get help with stress or any other injuries you might be carrying, call one of our practices now.